Christmas is family time – also in the Christensen family so this will be a short post. I just want to thank all my loyal readers and followers for following and commenting on my blog (and following me on Twitter and Facebook). It gives me lots of joy writing my blog and it is getting me in contact with interesting people from all over the world. I am grateful for that. 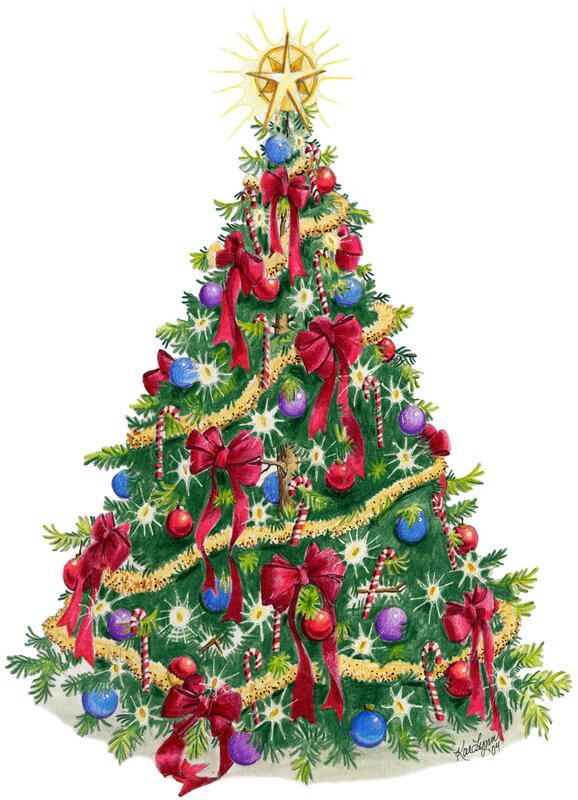 For those of you who are celebrating Christmas these days I wish you a Merry Christmas. Everybody has been following events in the Russian markets this week, but fewer have kept an eye on Russia’s smaller neighbour Belarus, but the small country is seeing some serious contagion from Russia. With the Belarusian rouble effectively pegged to the US dollar and the Russian rouble in a free fall speculation has been mounting in Belarus that the Belarusian rouble (BYR) could be devalued. And then on Friday Belarusian central bank reacted to these pressures and hiked its key policy rate to 50%! Furthermore, the authorities tightened currency controls by imposing a 30 per cent tax on buying foreign currency. Nothing is of course forcing the Belarusian authorities to do this other than the desire to keep the BYR pegged to the dollar. That commitment now means that we will get a very significant tightening of monetary conditions in Belarus and as nearly always when such a tightenning happens you will get a sharp drop in economic activity. Once again it seems like the Belarusian authorities are importing a crisis from Russia. I am not saying that I am advocating a Belarusian devaluation, but it is also clear that given the huge dependence on Russia it is hard for Belarus to maintain a peg to the US dollar when the Russian rouble is in a free fall. It looks like 2015 will be an “interesting” year for Belarus – we will have presidential elections in November 2015. PS I can only imagine just how bad things would have been if Gerashchenko – who Jeff Sach once called “the worst central banker in the world” – still was in charge at the CBR. PPS I got the story from “Russia Insider”. It has been a busy year for me – it has especially been the Russian-Ukrainian crisis, which has kept me busy. However, I thought that this week would be fairly calm – I didn’t have any traveling planned, not a lot a meetings scheduled and I had not expected to be too busy. However, things turned out very differently thanks to the spectacular collapse of the Russian rouble and a massive rate hike from the Russian central bank. After 15 years in the financial markets this is absolutely up there among the wildest things I have ever experienced. So frankly speaking I am a bit tired and not really up to the task of writing a major blog post. However, I have a lot on my mind nonetheless so I want share a bit of that anyway. First, in relationship to what have played out in the Russian markets recently I must say that I actually have been impressed with the Russian central bank. Yes, Monday’s 650bp rate hike in my clearly is a major policy mistake and the decision has brought more uncertainty and more financial distress rather than stability and the rate hike will just send the already badly damaged Russian economy into a even deeper recession. But one have to see the actions of the Russian central bank in the light of political pressures the central bank is under and that is the reason I am impressed. Russian monetary policy is far from great, but other Emerging Markets central banks would probably have made significantly worse decisions in a similar political and financial environment. Second, while Market Monetarists advocate NGDP level targeting we have been less outspoken on our support for (N)GDP-linked bonds (in fact I am not sure the other MM bloggers like NGDP linked bonds as much as I do). However, I think the logic of market monetarism also implies that we should be advocating that governments should issue bonds linked to nominal GDP. This would not only be a useful tools for monitoring market expectations for NGDP growth, but equally it would be helpful in “synchronizing” fiscal policy with monetary policy in the sense that fiscal policy would be automatically eased then the NGDP target is undershot and tightened when the target is overshot. This would also be helpful for countries where monetary policy is in different ways restricted for example by a fixed exchange rate regime. 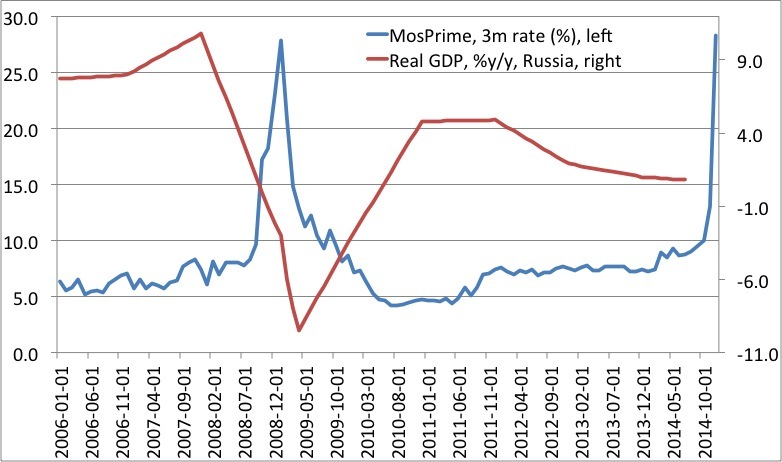 Third, the Russia crisis “story” and the topic of NGDP-linked bonds can be combined to a discussion of whether the Russian government should issue government bonds linked to oil prices – so when oil prices decline then debt servicing costs also decline. Just imagine what that would have done to reduce Russian default worries in the present situation. And this of course is linked to my favourite monetary framework for commodity exporters – the Export Price Norm. Hence, had all Russian government debt been linked to oil prices and had the rouble been pegged to a basket of US dollar (80%) and oil prices (20%) then I believe there would have been a much less spectacular crisis in Russia right now. There’s quite a bit of gloom in the air these last few weeks. The plunge in oil and other commodity prices, capital pulling out of emerging markets, and currency turmoil, have people getting very worried about growth prospects next year. There doesn’t appear to be a bottom yet on oil prices, and it’s anybody’s guess where all this will end up. In Malaysia’s case, oil price depreciation and Ringgit depreciation seems like one piling on the other – the latter is making things worse (Malaysians feel relatively poorer), on top of the drop in oil and gas revenues. But conflating the two like this is wrong. The depreciation of the currency is in fact a required and necessary result of the drop in oil prices. If the Ringgit had stayed where it had been (about MYR3.20-3.30 to the USD), the full drop in oil prices would have been transmitted directly and with full force into the domestic economy. The approximate 8% depreciation of the Ringgit over the past few months partially mitigates that income shock. Since sales of oil (and gas) are denominated in USD terms on the international markets, a cheaper Ringgit partially cushions the revenue drop in local currency terms. Consider that oil & gas make up about 20% of Malaysian exports; commodities as a whole about a third. That means that the drop in oil prices and the depreciation of the Ringgit have been nearly symmetrical. If anything, the Ringgit hasn’t dropped far enough – my estimate is that it should be at least 3%-5% weaker. …That suggests the last few months currency action has largely been a USD movement rather than weakness in the MYR. There’s also the flip side that the lower Ringgit should in theory provide a boost to non-commodity exports. In this case though, I’m a bit leery of depending on this as global demand growth outside the US and UK is pretty weak, and because again this is largely a case of Dollar strength more than Ringgit weakness. …Some have been interpreting …central bank intervention to support the Ringgit value…My view is a little more nuanced – the drop in reserves is just too small to make that conclusion. Contrasted with the pegged FX regime of the early ‘00s, reserve movements over the past four years are just too minor to affect the FX market. Rather, what I think is going on here is that BNM is simply trying to ensure that there’s enough USD (and other currency) liquidity in the interbank market to ensure, in their words, “orderly” market conditions. …The bottom line is that BNM is not and will not be “defending” any level of the Ringgit. And if they’re not willing to spend reserves on it, you can forget the interest rate defense (which doesn’t work anyway). Said in another way – the Malaysian central bank (BNM) has moved closer to my ideal of an Export Price Norm and that is benefiting the Malaysian economy. This is in fact what I suggested back in 2012 that the BNM should do. See also here – What the Turkish central bank did a year ago the Russian central bank is doing today. Not good. Greece’s Athex Composite tanked almost 13% Tuesday — the biggest drop for the index on record, according to FactSet. The renewed jitters came after the government, in a surprise move late Monday, said it would bring forward presidential elections to Dec. 17, potentially, setting the scene for snap elections in early 2015. …With Greece’s problems once again in the limelight, investors all across Europe. the Stoxx Europe 600 index slumped 2.3%, while Germany’s DAX 30 index fell 2.2% and France’s CAC 40 index gave up 2.5%. Greek government bond yields jumped 75 basis point to 7.90%, according to electronic trading platform Tradeweb. I must admit that the similarities between the continued euro crisis and the situation during the 1930s worries me a great deal and my regular readers well-know that I to a large extent blame the deepening political troubles in Europe on the deep economic crisis caused mainly by extremely tight monetary conditions in the euro zone. 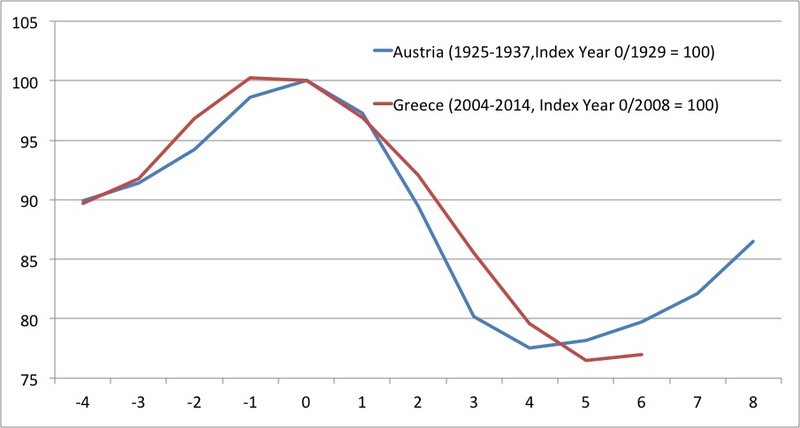 I used Austria as a comparison because the country had massive banking crisis (in 1931), had one of the deepest depressions of all of the European economies during the Great Depression and maintained the Gold Standard the longest. Given the scale of the crisis in Greece it is hardly surprising that extremist parties like Syriza and Golden Dawn are very popular parties. After all Austria disintegrated politically during the 1930s and eventually ceased to exist as an independent nation in 1938.